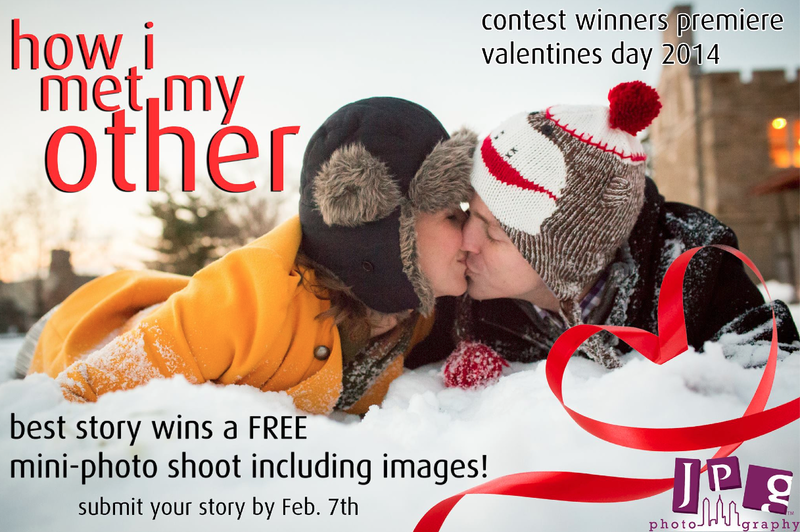 How I Met My Other: Contest Winner Gets a Photoshoot! Are you engaged? Do you think you have the most outrageous, ironic, weirdest, amazing love story of all time? If so, we want to hear it. With Valentine’s Day around the corner this is the perfect time for JPG Photography to give something away for FREE so we are hosting a contest. Tell us how your love came to be and you could receive a mini- engagement photo shoot including images. Here are the details! *Contest open to all engaged couples! So maybe you met wrestling crocs in the Congo or strapped to your skydiving instructor. Perhaps fate had it’s hand in your high school marching band and your oily, zit- infused face was the most beautiful thing she had ever seen. It’s all about presentation people. Make us want to meet you! Good luck to all contestants and congrats on your engagement!